Quo Vadis? : My second race! The story of my second race. I completed my second half marathon yesterday. 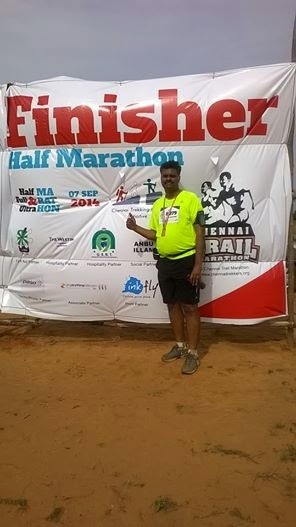 This was part of the Chennai Trail Marathon 2014 held near the Chembarambakkam lake. This event is different from other marathons because it is a trail marathon and by trail it means you run where there may be no road just a trail. Having signed up for this run, I was determined to train for it and I managed to complete a 21 two weeks before the event. As it was a LSD I was not looking at the time; I did a strong first half and took it easy on the return, however I felt that I was in good form for CTM despite never running on the trail before. Few of the others in my team had done a practice run on the route earlier but I missed it for various reasons. Work and travel ensured that my training took a backseat and then when I least expected it I got a viral infection that forced me to rest just before the run. So on the eve of the run I was out of practice and the illness had left me drained. I contemplated pulling out from the run before deciding that turning up is half the race won. So despite the misgivings of my better half I got up at 3 am and got ready. I joined the others and drove down to the venue. We reached the venue later than planned and found that the event was running late. So we got ready for the race starting with the warm up exercises. Strangely I was exhausted from the warm exercises and had to take a few minutes to gather myself. Again I wondered if I was pushing myself but amid the photos being clicked and the conversations I found myself at the start and in a few moments the race had begun. I started at the back end keeping in mind my planned timing and started to run. I tried to recollect the route in my mind and despite looking over the map several times the only thing that I could remember were the aid stations marked at every 2.5km interval. I decided to base my run on the aid station and to assess myself at every station. At the first station after just 2.5 kms or so I was exhausted and replenished myself with the bananas and the mosambi. Then I thought I will continue to the next station because 5km finish is better than a 2.5km and so I set off again. By now my legs were warm and I was feeling a little better and soon I reached station 2. Here I treated myself to the chocolate and peanut candy and felt that I can actually go on to station 3 and I started off again. I crossed station 3 and 4 and by then though tired I felt confident that I will cross some more stations. Along the way there were these wonderful children living in the villages nearby who encouraged the runners with bright smiles saying “well done anna / akka” and giving high fives to the runners. I gave a high five to every one with a “thank you”, some actually said “welcome”! The smile they had after giving a high five and their delight in encouraging the runners was so infectious that I decided that I will finish this run. I must mention that somewhere on the way there was this incredibly wonderful smell of chicken curry cooking for breakfast that made me run just a little bit faster. After 16 odd kilometres the sun was out in full force and my pace had dropped considerably I was almost walking most of the distance as again I was exhausted. I pulled myself across and reached what was for me the toughest part of the course a one kilometre or so of grass bank. Ideally this will be fun to play and having run across some horrible terrain this should have been easy but it was annoying. The ground was soft and the earlier rains had made it spongy and somehow the idea of running to a board and making a U turn to return back felt silly but that had to be done and it was also done. At the last aid station I was informed that the finish is just 300 metres ahead. I looked as far ahead as I could see and I saw nothing. I started running and entered a small wooded section and again I was informed that the finish was just 100 metres ahead. I looked again and saw nothing and I can see fairly well without glasses. With no other option I kept running when suddenly I saw the words “Start”, I started running a little faster and crossed the finish which was the same as the start. I got my medal and then I realized that it was worth the toil, all 3 odd hours of it. I looked at my watch since I had mistakenly switched off the GPS tracker on my phone. I was around 7 minutes beyond my self-imposed deadline but I had also given myself the chance of giving up. Completing the course was immensely satisfying because it was a mental victory more than the physical victory. As it is said, "If you think, You can"
Kudos to you Clement. As you said, showing up itself is a testament of courage. Even if you had not finished the half marathon, it wouldnt have mattered. I dont know when I can push myself to get into the shoes and run.